2. Beaconsfield High School, and....a hat judging! The next day, I was off to Beaconsfield High School. Year 7 students all took part in a competition to design a hat for formyhead.com, and raised funds for Teenage Cancer Trust. I was the guest hat judge! There were SO many that were gorgeous, it was a very difficult choice. 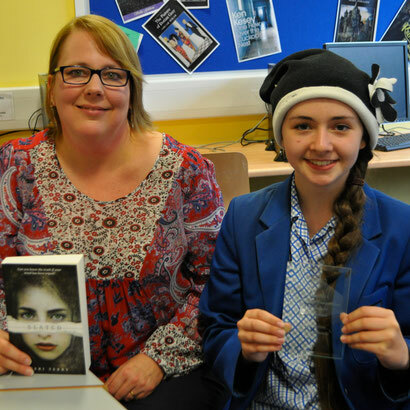 Then I spoke to the year 7 students, answered some questions & signed some books. 3. The Amazing Book Awards, Sussex Coast Schools! And for my next adventure? 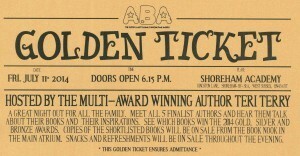 I hosted the ABA book awards! Slated won the ABA gold award last year, and I had so much fun that I volunteered to host it this year. They had golden tickets: gotta like a golden ticket. Silver was Gillian Cross, and bronze, The Killables. 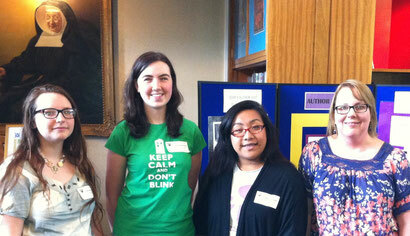 Next up on Saturday I headed for London, and the first ever Young Adult Literary Convention in the UK. It was part of the massive and awesome Comic Con. Unfortunately as I was travelling back from Brighton, to home, then to London on the same day - I didn't make it to the YALC until it was done for the day. But WOW did I see some awesome characters coming out of the convention! And then I went to not one but TWO parties - both fringe & official. I didn't take a camera but have to link Sarah McIntyre's awesome blog: take a look at her photos!! OK, this has nothing to do with books. I get that. But I had a great day. Apart from the sunburn. And finally? On 14th July I went to Weston Favell Academy, Northampton. I spoke to year 9 (and some of year 10), then had a lovely enthusiastic group of students from a bunch of different year groups in the library. It was a real high to end the year on. OK, I know it is July - I mean the school year. No more school events until next year! The summer is usually pretty quiet, event-wise. 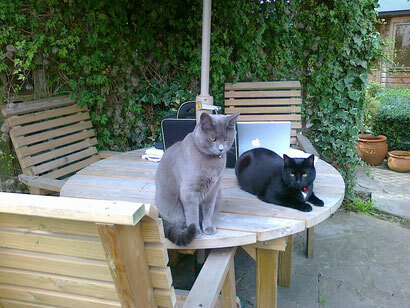 I plan to spend most of it writing my very creepy new thriller - I LOVE writing in the summer in the garden. Though if you're in London for Loncon3 - the World Science Fiction Convention - I'll be on a dystopian fiction panel on 17th August. wow looks like uve been having fun, im glad u enjoyed urself. I wish I went to ABA this yr, but sadly I ad something to do. I saw you last yr, and u signed my book slated, yippee! Hope to c u in brighton again :). Just wondering when will you publish ur next book, cant w8!